Any blank wall can be an opportunity for adding logo environmental graphics. Environmental graphics are anything that enhances a physical space visually. 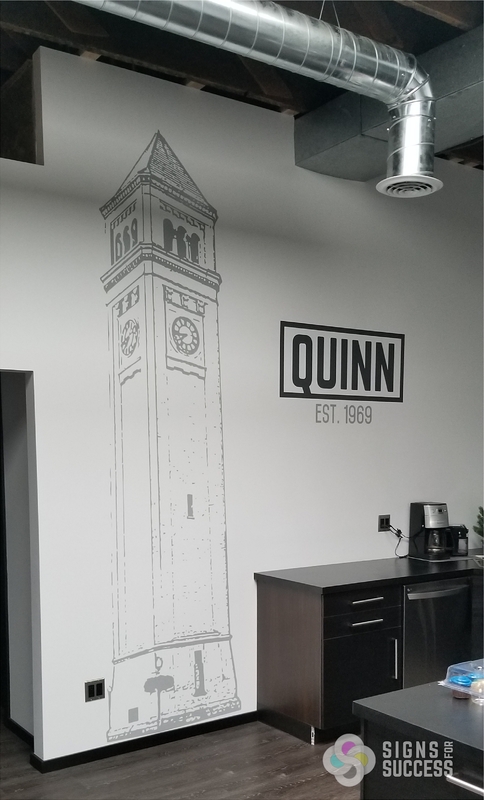 At their Garland location, Quinn found opportunities to add graphics that create more visually interesting spaces, indoors and out. 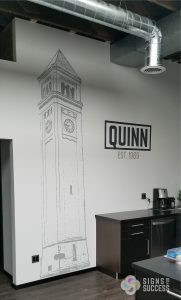 In their case, Quinn not only added appeal, but were able to incorporate their logo into the design as well. In the outdoor chill zone, the simple, modern logo cut in half and presented vertically becomes wall art itself. Inside, they take advantage of a blank wall to incorporate the iconic Riverfront Park Clock Tower and again, their logo. Vinyl graphics can be applied to a variety of surfaces, even rough or porous surfaces like concrete or brick. We use laminated conformable vinyl for rough outdoor surfaces. It’s perfect for historical buildings that don’t want penetrations in their brick or exterior walls. With heat, the vinyl comes off cleanly, making changing out the graphics a breeze down the road. Indoors, we recommend high performance vinyl for long-term graphics. It too has a releasable adhesive that allows the vinyl to come off cleanly when it is time to change out graphics. Intermediate vinyl and other adhesive materials are also available. Logo wall graphics can make great environmental graphics. All you need is a blank wall and some imagination. We’ll take care of the rest. Signs for Success is a locally owned family business in Spokane, and we strive for excellent customer service, perfect color, and quick turnaround on every project. Our large production facility allows us to design, print and install everything in-house. Contact us for a free quote on logo environmental graphics today!